The highly successful PLSC Lion, which introduced pneumatic tyres as a standard feature, was replaced in Leylands range by the LT1 model. This vehicle utilises the later T type engine in its four-cylinder form and has bodywork by Charles H Roe of Leeds, and is understood to be the oldest surviving example of a Roe body, the sagging evident from front to rear being indicative of its age and the use of wood rather than metal or composite construction for body frames pre-war. 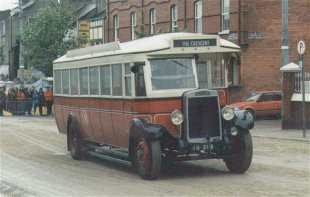 Supplied new to Lancashire United Transport of Atherton, Lancashire it was registered on 25 March 1930. 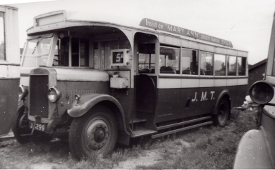 It was withdrawn in March 1946 and subsequently passed via Woodwards Ltd of Bolton Road, Atherton, to Jersey Motor Transport who operated it until December 1958. It was acquired by the Society in 1959 at the same time as fellow Lion KW 474, and was shipped from Jersey to the London Docks on the vessel "Jersey Coast". Now restored to its original livery, it is still largely in 'as built' condition. No. 202, after withdrawal from passenger service in Jersey, rear of Snow Hill Depot, Summer 1959. 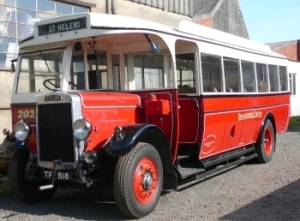 In 1998, 202 travelled to Ireland, along with our Leyland 'Badger' and appeared - in "GSR" guise in the film 'Angelas Ashes'. 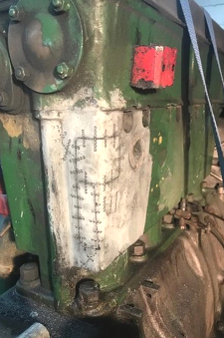 It is currently off the road awaiting a number of repairs. April 2013 - We have had the opportunity to consider ordering 6, 22 inch tyres for TF 818. These are being made as a one off in the USA and will enable it to be roadworthy again. Trouble is these are approx £ 500 plus VAT each. And we have to say YES or NO pretty soon! We have no funds for these at the moment, so if anyone has any way of helping we would love to hear from you! TF 818, Lancashire United 202 is one of the two buses repatriated from Jersey on the Societys formation in 1959. 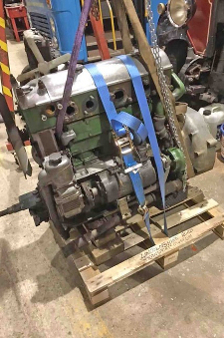 February 2019 - 202's original engine has been safely delivered to specialist repairer Surelock, Oakham. 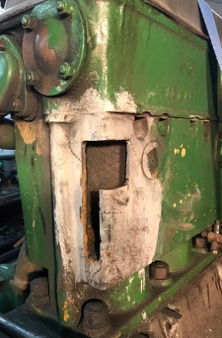 Heavy corrosion of the waterways was cut away and cold metal stitching used to make a watertight repair. This method uses nickel alloy rods to join metal instead of welding, where the heat would cause a lot of distortion. The engine should be back with us soon. 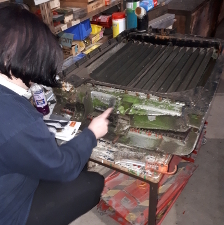 Work has also been carried out on the radiator - still showing traces of Jersey Motor Transport green paint on the inner side.